I'm 25, married, with a 5 year old, and 16 month old twin boys. I joined the military right out of high school. I met my husband in my second phase of training and we've been together 6 years. The military took me to Germany and kept me there 6 years because of my husband. I separated from the military shortly before my oldest son was born and have never looked back. It wasn't for me and some days I wonder at my own strength and determination that brought me through basic. Boxes, boxes, and MORE boxes! Week of relaxation in Florida! Today is the day and it started at 330am. Twins were a terror to get to sleep last night. They woke up around 9pm and didn't want to go back to bed. Joe used the pull out bed and our massive amount of luggage to corral them. Eventually they went back to sleep. The shuttle picks us up at 430 so we can fly out of Nuremberg at 730. Our day of flying doesn't end until we land in Alexandria at 930pm central time. When our day will finally end with a bed is anyones guess. The last six years seem to have flown by. I've seen some stuff and met a lot of great people. I need to get off of here before I turn into a ball of tears. There will always be a place in my home for my friends. So keep in touch and know that this isn't good bye, merely an extended see you later. Click here to join the forum fun! 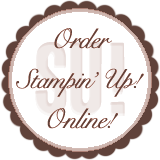 Click SHOP NOW on my site to order online today!